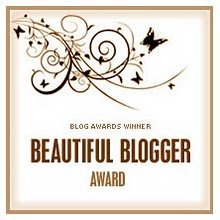 I recently received a Beautiful Blogger Award! I was so surprised when Ravanel (http://ravalation.blogspot.com), a fellow blogger who I admire, gave it to me and mentioned danania.net on her site. She is very talented both as a writer and as a gamer, so I was honored to have her view me like that. I met Ravanel when we and many other bloggers signed up on the NBI in May-2012 (Newbie Blogger Initiative @ http://nbihq.freeforums.org/). Ravanel was one of the other finalist bloggers in the Best Newish Blogger category. (Best-Newish-Blogger) I voted two different days; once for her and once for myself. As is obvious by her blog, she has great computer savvy and is a fun story teller. ~In the beginning. In the beginning there was Pong, and it was good. I did enjoy my Atari games! I recall some games next along the way, such as Oregon Trail (actually I played it with a book and maps in school before it became a computer game), Civilization, and Warlords 2 (one of my all time favorites). Then, I enjoyed Warcraft and Warcraft 2, but had not played them online. My first online game was Diablo 2. I remember the frustration of a slow dial up modem, watching the lights blink as it tried to connect. No good, but I did like playing the Diablo 2 barbarians. J I enjoyed Nintendo a bit more… Donkey Kong 64. I had never seen anything so amazing. I could move my monkeys 3 dimensionally, similar but different than Diablo 2. ~Then came lotro. Fast forward a couple of years. My friends talked me into trying lotro. I had never actually played a MMO but I was hooked immediately. I wanted to know more. I didn’t want to miss a thing. Not one quest or deed. I figured that someone had gone through the effort of designing this entire world, *just for me*, how could I do less than see every corner of what had been built for me? I was a Runekeeper, and an Explorer/Tailor. But, I did not know much. Danafact: the first time I met defeat I think I was level 7. I had not even left the Intro. Being completely unfamiliar and a noob gamer, I had not gotten the hang of don't-cast-induction-skills-over-and-over-while-monsters-are-killing-you. But, I was learning. ~Szarwyn. I read about Szarwyn, a player from Arkenstone who had become the first “Featured player of the month”. Seeing the date now makes me smile. I had literally been playing one month when she became the featured player. 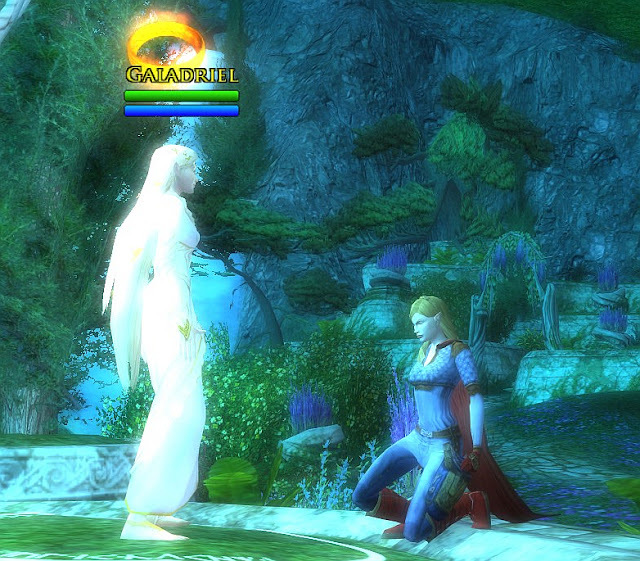 She was in Arkenstone, so I congratulated her. She replied and was very nice! So, I now had a friend, who introduced me to her kinship, the Riders of Rohan. 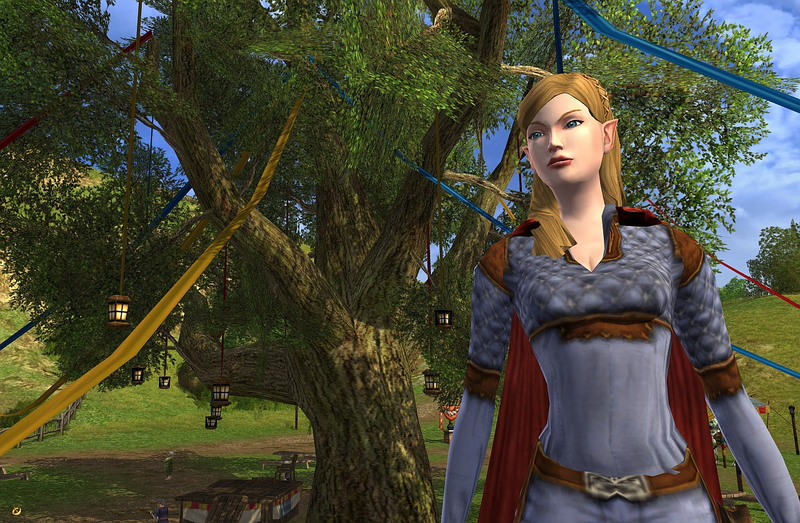 It turned out that she was webmaster of a truly amazing site and forum which was all about lotro! After reading everything in the Riders forum, thousands of posts, I asked if I could join the forum without joining the kinship, because I couldn’t leave my friends and family kin. No one had ever joined their forum without joining the kin, but she and the officers made an exception for me, a little, unknown but excited elf. ~The forum and Creative writing. I enjoyed the Riders of Rohan site. It was really well laid out for guides and forums and events. I learned from those around me and discussed what was happening with me in-game. Most of the kin was at end-game (65), and here I was just now 30 something. I would take pictures, write stories, design contests… people seemed to have a good time with what I was doing. It was a new experience for me. “Creative” writing might be one of my weakest areas. When I wrote in school, it was always technical. Even when I branched out, I was technical. I recall in my Senior English class, while others were writing about sports or social commentary, one of my term papers was on applications of Newton’s Law of Cooling, in which I explained how to “Determine the Time of Death” using thermodynamics. It was complete with explaining differential equations and theorems until the professor had me take out many of the Greek symbols and simplify. Unique? Perhaps. “Traditionally creative”? I dunno. Ok, that last paragraph went off on a tangent. The point was that while I was writing stories on the forum, people were recommending that I start a blog… but I had no idea what that meant. The reply was… “you are doing it now, except you are scattering the stories across various posts”. It did in fact look like a scavenger hunt. ~The transition. Szarwyn built a section on the site just for me. It was my very own blog! From the time I joined the site until then, I had written 1000 posts (or replies, etc), many with pictures. That was my “warm-up” into the world of blogging. I still had not seen another writer-Blog (unless CSTM qualifies as a blog, though I think "mecca" is probably a better term for CSTM). I just did what I enjoyed …until ~gloss over this next part ~ the kinship moved to a “low-function-low-maintenance” guild site, the webmaster went a different direction, and the site imploded and everything was gone. With my friend’s advice, I picked up my very new blog and moved it to Blogger. Danania.net had been born. You can see that the first 10 posts on danania.net were written before the move. ~The NBI. I continued writing but now I was on my very own site! I enjoy it, and I learned basics about how to work with Blogger. I still read CSTM as my main news source. One day, CSTM carried a post about the NBI, aka Newbie Blogger Initiative (http://nbihq.freeforums.org/). 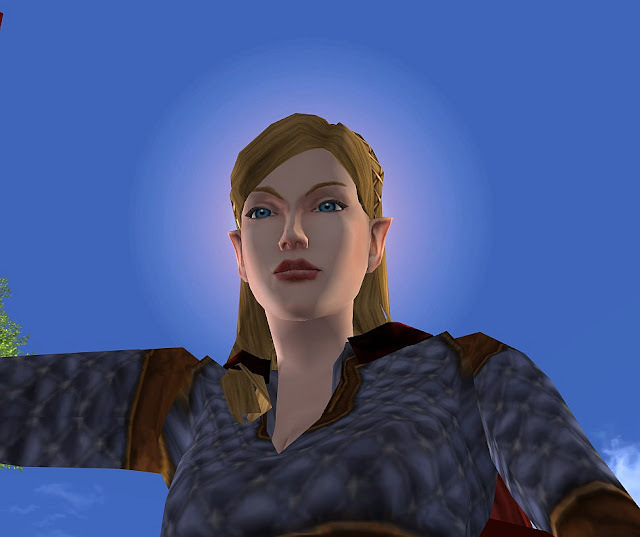 I followed the link and to my astonishment, there *are* other bloggers out there, a *lot* of other bloggers, many who write about lotro! Syp, the NBI leader nominated me into the category of "Best Newish Blogger" …and you dear Readers showed up by the truckload to vote. Wow! Now that was a humbling experience, knowing that you actually cared. Talk about motivation! ~Why I continue to blog. I bring my passion for my hobby to danania.net. …and you show up. I see it in the Blogger visitor stats. You sign up in the “Followers” list. You comment. You tell me about it in game and send mail. You enjoy the stories and get value out of the guidance I try to provide. I love and thrive on the feedback. And, I want to do better. If I build it, you will come, and that makes me happy. Dana’s Day: I am married with young children and am an engineering manager for a large company. My day starts around 5:45am. We are up and kids are out the door and off to school by the time the sun has risen and I am off to work. I do engineering stuff for the bulk of my day. To what? It is roughly 8ish hours until I wake up and do it again. 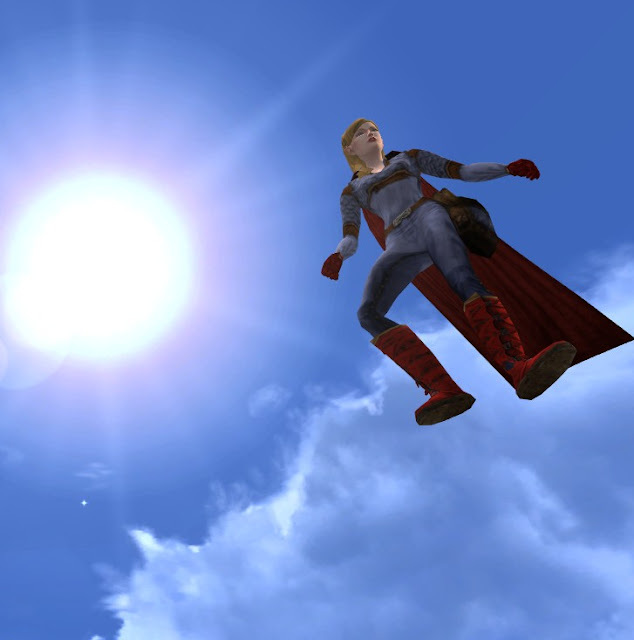 How bad does the fire burn within me to enjoy my hobby, to save Middle Earth, and be the Supergirl of Lorien? This is my main playtime, when everyone else goes to sleep. Mebbe one day, my Fortitude to burn the candle at both ends will run out, but that day is not today, the fight has not yet left me, there are quests to do and Steeds to acquire! Besides, I have the DVR running to watch “Once Upon a Time” on ABC, “Switched at Birth” on ABC Family, and catch the reruns of "Sliders" on the Hub network. (I am hoping that Sliders is better than the reviews say as I have never finished the series.) My all time favorite series were Quantum Leap and Chuck. My favorite cartoons were/are “Kim Possible” and “Phineas and Ferb”, and my favorite “shows-that-only-I-seemed-to-like-because-they-were-canceled-early” include “Flash Forward” and “Journeyman”. Collaboration: Another interesting question. I did mention that part about barely even realizing that other bloggers were out there when I started not that long ago. Since then, I have been so excited to read other blogs! The NBI had an amazing number of gamer writers, and Blogger has features to search for other bloggers. I put some of my favorite links on my page, (Danania's Links) and am still finding new blogs I like to read each month. I try to share them as I write new articles. Does Aegthil count as a collaboration? The letters danced back and forth between http://lotrominstrel.blogspot.com/ and http://www.danania.net. You can get up to speed with the summarized post, Adoration. When I game, I often think about how what I am doing might bring joy to my blog. I mentally prepare posts well ahead of time and often have at least one post written in advance, and stick to the Tuesday (and sometimes Friday) schedule. When thinking about this question, I wondered “do I game just so that I can have entertaining things about which to write?” Which is greater for me, danania.net or actually gaming? The answer would still be gaming. I love playing with my friends and meeting people. However, writing about what I do and what I have learned (or am trying to learn) brings such joy to me now that I have trouble imagining one without the other. As long as you show up, I will continue to rolls the drums. Thank you so much for making danania.net full of life! When I received this award, it was with the responsibility to nominate someone else. I am really starting to get into reading other blogs and enjoy so many of them, but there is another that has really sparked my interest that I have read regularly. Lothirieth has such a quick wit about her. She has the cunning ability to read between the lines and understand the way things work. I have learned much from reading the way she sees the world. I believe that she is the type of person that could change the world (or go Incredible Hulk on it and Smash!, hehe, tune in to her site to find out). Also, she has an artistic side and has a flair for taking interesting pictures! 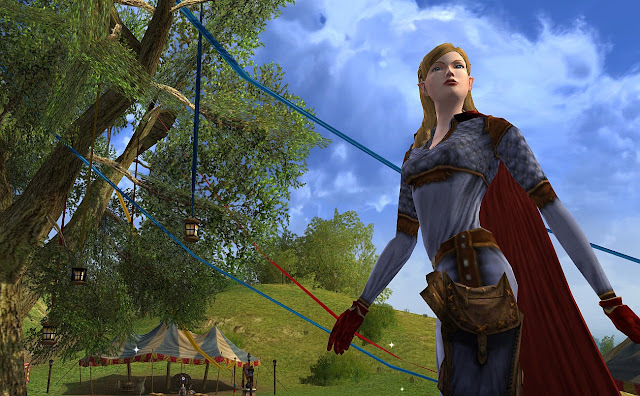 Lothirieth is a deserving Beautiful Blogger. Thanks for being you. Enjoy. Wow! Congratulations, you completely deserve it, Danania! Lol! Funny that you mention the "official forums". I didn't realize such a thing existed for the first year of my time in Middle Earth. I still haven't gotten acclimated to checking it as often. Congrats on a well deserved award and as a family man I am even more impressed at the quality of your blog given your other commitments. 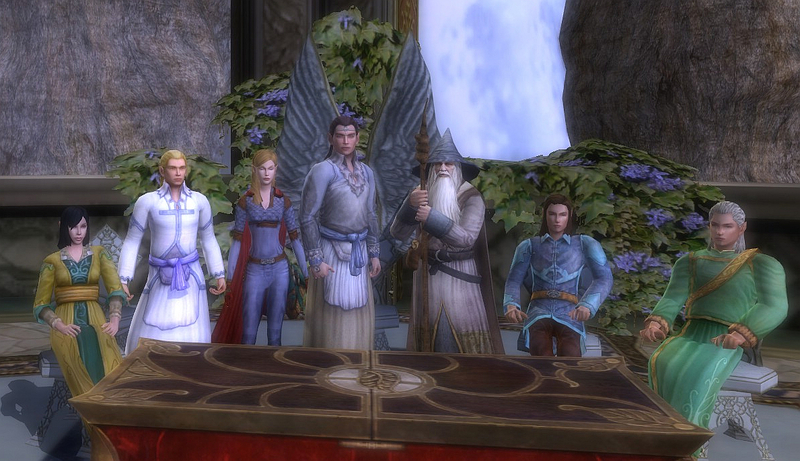 I hope you can keep Lotro & your blog in your work/life/play balance for the long journey to Mount Doom. I am surprised though that creative writing was ever your weak spot. The way you write makes it look like you have been doing it pretty much your whole life so that by now it just comes naturally to you. That you are also skilled in technical writing makes it even more impressive. They are two hard skills to be good at, in my opinion. I appreciate the comments. They are like a light in dark places, when all other lights go out. My creative writing is styled very differently than technical writing. It tends to be more free-form. I still loathe typos and deep grammatical errors, but sentence structure is much looser (not that I still won't make typos, but when I see them after the fact it feels like taking an arrow to the leg). 1. Congrats on the award! 2. Do the littlehobbits know that you call them hobbits? Do they know what hobbits are? Do they think that they are actual hobbits and try to not wear shoes and eat multiple breakfasts and laugh in a "fruity" manner? Yay Endacil! Thanks for dropping by danania.net! I will try to inform well. Always a pleasure to have you here. Thanks Ravanel! I was proud that the flying picture turned out as well as it did! lol! It doesn't "feel" like I have so much energy some days, hehe.